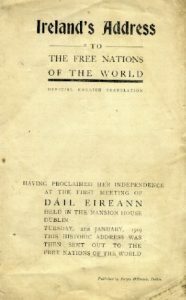 Next January the Peadar O’Donnell Socialist Republican Forum will mark the centenary of the first Dáil Éireann and the publication of one of modern Ireland’s landmark documents, the Democratic Programme. 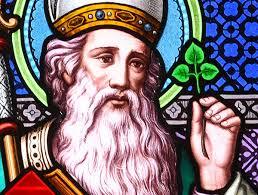 The forum will celebrate the occasion with a conference in Liberty Hall, Dublin. While it is important that seminal events are remembered, it is also necessary that we learn from them. There are lessons from that era that are not only of historical interest but have relevance to contemporary Ireland and its relationship with the rest of the world. The celebration on 19 January 2019 in Liberty Hall, therefore, will go beyond a simple commemoration: it will also explore the progress, or lack of it, since then and ask participants to contribute towards making a positive and progressive impact in the days to come. The people who participated on that historic occasion in 1919 not only asserted the Irish people’s right to self-determination and independence but also identified a need to rectify serious social and economic issues that had a detrimental effect on Ireland’s working people. Moreover, they also created a political arena that had the potential to implement these tasks. That the eventual outcome did not fulfil its intention is cause for regret rather than outright dismissal. 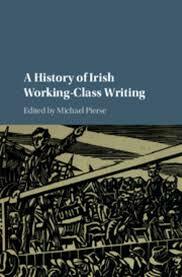 Firstly, therefore, let us look briefly at the conditions under which working people live and labour in today’s Ireland. A century after the publication of the Democratic Programme, which included the statement that the Republic will “reaffirm that all right to private property must be subordinated to the public right and welfare,” there can be little doubt that this objective has been decisively rejected by governing institutions in Ireland. The dogma of free-market capitalism is ruthlessly implemented, with little care for its effect on working people. There is a housing and homelessness crisis, with the neo-liberal Irish state, in spite of an obvious emergency, insisting on the provision of houses through the private sector, notwithstanding the abject failure of this policy. Lengthy hospital waiting-lists, and the spectacle of patients parked for hours on trolleys, is a national disgrace. Exacerbating difficulties within the health service is the absence of adequate provision of home help for the elderly. Nevertheless, this state persists with the detrimental practice of maintaining a parallel private and public health service. Typifying the Irish state’s neo-liberal ethos is the fall-out from the Carillion fiasco.¹ So determined was the Dublin government to assist the privileged elite that this reckless British company was awarded responsibility for the design, building, financing and maintenance of six new schools around the country. This so-called public-services company powerfully illustrates the drive towards the privatisation of public services that has been relentlessly pursued over the past decades. Whereas once the capitalist state provided a protective structure whereby an elite would profit from manufacturing and finance, this has now become a situation where the state also ensures that a favoured few benefit by being paid handsomely to manage public services. In the process, standards are frequently lowered, trade unions are often expelled, and ultimately, if privatised, the management fails, as Carillion and others have done, with the taxpaying public picking up the bill. Illustrating the sheer mendacity of this regime was the astonishing spectacle last year of an Irish government refusing to accept €13 billion in taxes owed by the enormously wealthy Apple Corporation. In the light of all this it is reasonable to ask whether a sovereign Irish republic as asserted in the Mansion House ninety-nine years ago exists in any real sense in Ireland today. In the first place, a raft of restrictions is imposed on the popular will as a consequence of membership of the European Union. This can only get worse if proposals for closer integration, coupled with the strengthening of the euro zone, are implemented. Moreover, it is likely that this will come about, since the Davos poster-boy Emmanuel Macron is proposing this very package and has recently been receiving backing form the supine leadership of Germany’s Social Democratic Party. More worrying still is the flagrant violation by the United States of what is left of Ireland’s neutrality. This was emphasised last month at Shannon Airport, where the vice-president of the United States, Mike Pence, posed for photographs as he shook hands with American soldiers in combat fatigues. These soldiers, bound for Kuwait, are clearly not tourists, and their presence in Shannon Airport makes the Irish government party to their military campaign. Let us not be complacent either, because this situation has a resonance beyond national pride. The Bulletin of the Atomic Scientists has moved its symbolic Doomsday Clock to two minutes before midnight,² thanks largely to the “unpredictability” of Donald Trump. Compromising neutrality, therefore, poses a risk that Ireland could be dragged almost unwittingly into an imperial war. To address the problems arising from a diminished sovereignty coupled with the destructiveness of neo-liberalism, it is worth reflecting finally on a central concept promoted by the first Dáil. This was the extension and empowerment of democracy. 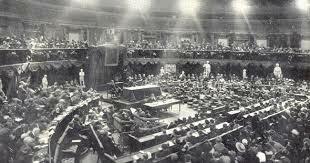 Those who gathered in the Mansion House on that January day could have taken their seats in the British Parliament but, while forming a significant bloc in the House of Commons, would nevertheless have remained as impotent as the Irish Party had been fifty years before. Just as then, there is now a need to facilitate a more participatory form of democracy, one that is not at present available. The Peadar O’Donnell Socialist Republican Forum is not calling for anything as dramatic as the creation of an alternative parliament. What it seeks to do, among other things, is to draw attention to the limitations imposed by a reliance on the existing parliamentary process, where, in the words of Lenin, “capital exercises its influence on the state power.” The powerful and inspiring campaign against the water tax taught us that single-issue campaigns are effective but can be limited. Without the continuous popular pressure of a mass movement the ruling class make strategic concessions that can be eroded in time. The Forum plans thereafter to use its celebration of the first Dáil in 2019 to explore and advocate the establishment of a wider forum, aimed at encouraging political discourse and promoting the creation and direction of a bottom-up mass movement. Doing this, however, requires the building of a regularly convened assembly or arena designed with the intention of identifying and promoting a comprehensive programme capable of transforming Irish society. What the assembly would be named, how it would be made up or where it might be convened are matters for democratic agreement and are not a prerogative reserved by the Peadar O’Donnell Forum. What the forum does insist upon, though, is that a hundred years after the first Dáil the Irish working class must be allowed to realise the promise and potential of that assembly’s Democratic Programme. Paul Mason, “Ink it onto your knuckles: Carillion is how neoliberalism lives and breathes,” Novamedia, 15 January 2018. “Doomsday Clock moved to just two minutes to ‘apocalypse’,” BBC News, 25 January 2018 (www.bbc.com/news/world-42823734).